Easter is a time to celebrate the resurrection of Jesus from the grave. 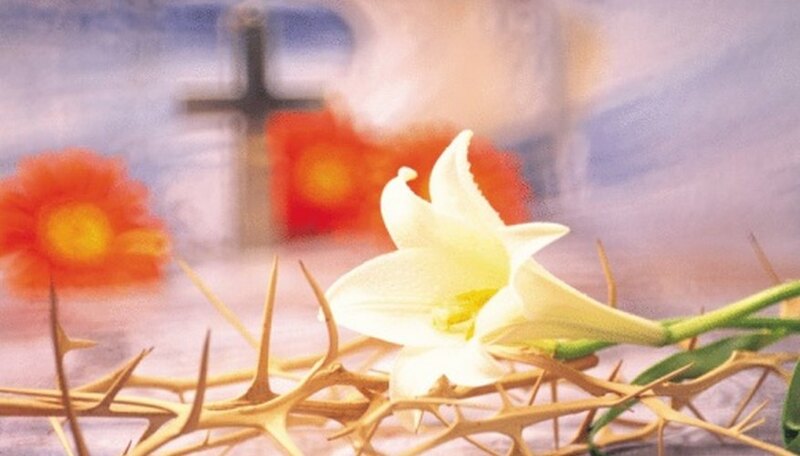 Crafts showcasing the resurrection bring to life the real meaning of Easter. Read the resurrection story from Matthew 28:1-10 as the children make the craft. Later they can act out the story with a paper plate tomb craft. Coloring pages and printables also help children remember the resurrection. Spread a large coffee filter flat on a piece of waxed paper. Offer a wide range of washable marker colors for the cross. Have the child draw lines or circles around the coffee filter with each marker color. Using a spray bottle, squirt the center of the coffee filter two times. Watch as the water wicks the color across the filter. Spray again if the color does not reach the edge of the filter. As the filter dries, prepare the black cross border. To create the border of the cross, fold a piece of black construction paper in half. On the fold, cut out half of a cross. Open the paper to see the full cross. With a white crayon, write “He has risen” across the top of the black paper. Once the filter is dry, tape it over the back of the cut out cross. The colored filter will fill the shape of the cut-out cross with color, like a stained glass window. Cut a paper plate in half. Color one half brown and the other black. Cut a small semi-circle out of the bottom of the brown half, thus making the tomb entrance. Draw an angel out of white construction paper. Angels can also be cut out of old Christmas cards. Make the angel small enough to be seen through the tomb entrance. Glue the angel to the black background in the tomb entrance. Crumple a piece of brown construction paper to make the rock. If the rock needs to be larger, crumple another piece of brown paper around the first and secure it with tape. Staple the two paper plate halves together along the rounded edge. Draw and cut out a figure of Mary Magdalene and the other Mary. To save time, print out templates of Mary and glue them to a wooden craft stick. Retell the story and have the children roll the rock away to see the angel. Cut a 10-inch length of string or yarn to start the bracelet. If you are working with younger children, tie a knot about 3 inches from the end to keep the beads from sliding off. Give each child a black, red, white, green, and yellow pony bead. Thread the beads on in order based on their meanings. The black bead symbolizes sin that Adam and Eve brought into the world by disobedience. Next is the red bead, which represents the blood that Jesus shed for our sins on the cross. Thread the white bead on next, which shows that we are made white as snow when we accept Jesus as our Lord and Savior. Green is the next color on the bracelet signifying our growth in Christ. Finally, the yellow bead denotes eternal life in heaven. Tie a final knot on the string to keep the beads in place. Review the meanings of the color beads with the children so they will be able to tell their friends about the bracelet. Lisa Roberts embarked on a writing career after 10 years in human resources. She holds a bachelor's degree in human resources and marketing from Baylor University and has worked in the education field for more than 12 years.